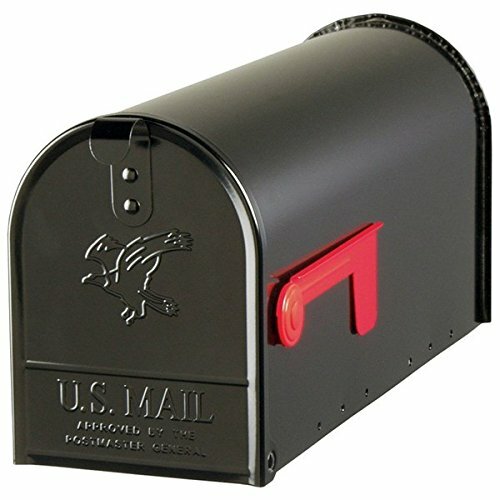 Fulton Corporation 20410574 Large Premium Steel Rural Mailbox, Black by Fulton at Sunny Doors. MPN: 20410574. Hurry! Limited time offer. Offer valid only while supplies last. Product Features:This large, heavy-duty mailbox comes fully assembled with a steel latch and aluminum flag. It has a smooth rust resistant finish. View More In Post-Mount Mailboxes. This large, heavy-duty mailbox comes fully assembled with a steel latch and aluminum flag. It has a smooth rust resistant finish. America's #1 Selling Mailbox. Features: -Mailbox. -Material: Galvanized steel. Fully assembled. Embossed American Eagle design. 1/3 heavier than other large rural mailboxes. Comes fully assembled with a steel latch and aluminum flag. Ready to install. Smooth rust resistant finish.. Dimensions: 10.875" H x 8.5" W x 20.5" D.
This large, heavy-duty mailbox comes fully assembled with a steel latch and aluminum flag. It has a smooth rust resistant finish. America's #1 Selling Mailbox. Features: -Mailbox. -Material: Galvanized steel. Fully assembled. Embossed American Eagle design. 1/3 heavier than other large rural mailboxes. Comes fully assembled with a steel latch and aluminum flag. Ready to install. Smooth rust resistant finish. 7 Year warranty. Dimensions: 10.875" H x 8.5" W x 20.5" D.